Japan Technology - High End Japanese Performance! Japan Technology has quickly established themselves as one of the leading manufacturers of high end offstring yo-yos, and now they're setting off to do the same thing with string trick yo-yos! This is the Japan Tech Fireal! Since it's their first string trick yo-yo we weren't sure what to expect from Japan Tech, but given their reputation we knew it would be something cool! 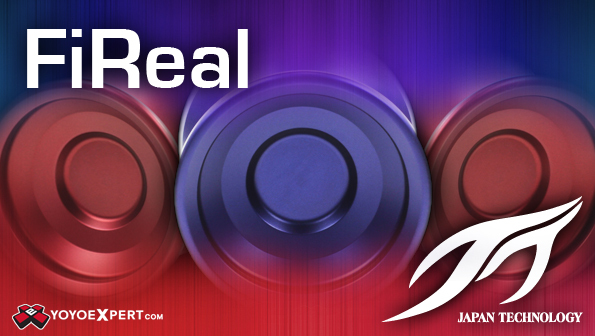 The Fireal was designed to be different from the standard popular competition yo-yos on the market today. Instead of focusing weight distribution heavily towards the rims they chose a more even weight distribution. Complemented by the slightly flared profile and nice stepped inner cup and this yo-yo has a feel unlike any other! The Fireal has such a fun and unique feel in play. The light weight and flared profile make this yo-yo move as fast as you need it to go while the even weight distribution gives you so much maneuverability you'd swear it was reading your mind!